Northwest National Real Estate: Sold! Fantastic Bitterroot Views! Fantastic view of The Bitterroot and the Sapphires immaculate mini farm with free standing garage/shop. Lovely guest house with a past rental history of $650.00 to $700.00 a month. Glowing hardwood floors, new roof, beautiful gardens throughout the lawn, separate fenced pasture, extremely well maintained property throughout, newly planted fruit trees, must see to appreciate. Fish the world class Bitterroot and East Fork Rivers. Large herds of Elk, White tail, Mule Deer all just a few miles from this beautiful valley location. 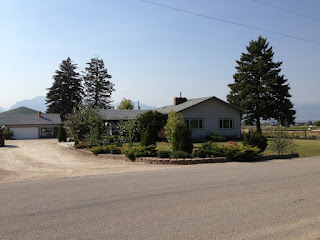 Call Craig Kreider today for a showing 406-369-5444. A property in this condition will not last! Priced at $229,000.